If you enjoyed my e-book on writing style, take a look through this list of recommended readings. If you haven’t yet read the guide itself, download it (for free) here. If you’ve read the e-book and want to learn more, there are two paths to improvement. One is to read actual great stylists, to learn from the best. The other is to read scholars of style and prose, so that you can train your eye and ear to better understand what those stylists are doing. The two paths work best together, I think. If you only take the first path, much of the actual technique on display will wash over you, unseen, too powerful to absorb. If you only take the second, you can get a pallid, rule-ish, merely-theoretical idea how great writing works. This novel is funny, daring, disturbing. Virginia Woolf at her best. Let’s be serious. This is the Great American Novel. These stories capture real workers, real thinkers, in the most minimal and careful prose. Amy Hempel’s miniature stories are fascinating. These stories will make your head reel with their strange sonic qualities. Hard to remember reading afterwards, impossible to stop reading while. The classic sci fi / horror saga. This is a good book and a quick read. Elaine Scarry somehow writes scholarship on familiar topics in a brilliant style that yet feels easy to read. Brooks Landon’s audio course, Building Great Sentences: Exploring the Writer’s Craft and accompanying book, is a fantastic introduction to the cumulative sentence and prose style in general. Get the course and listen — you will learn so much. It’s probably the easiest way into Christensen’s ideas. Lanham’s guide to style in many different forms. 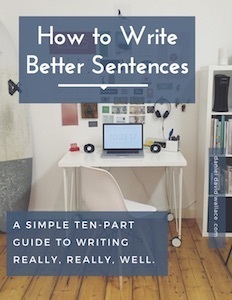 Nora Bacon’s textbook is aimed at college-classrooms but is useful to every writer. David Jauss’s ideas about fiction and writing in general are always fascinating. This is Francis Christensen’s master-work. Not always easy to follow, but a remarkable, remarkable short book that will transform your understanding of writing and style. Virginia Tufte’s book is strangely little talked of today, but it is a fantastic guide to writing in all genres.